Say M-Audio and you probably think of plastic keyboards or USB audio interfaces, but M-Audio’s latest creation is a multi-pattern, large diaphragm studio condenser microphone, with a retro design and a military-grade vacuum tube. The Sputnik is not M-Audio’s first microphone — they make a line of budget-minded condensers — but M-Audio is crowing about it in a big way. By budget, we’re talking US$699.95 list. But it’s the mics to which M-Audio is comparing the Sputnik that might get some interest. M-Audio claims that “top Los Angeles recording engineers . . . observed [in side-by-side comparisons] that Sputnik exhibited the coveted low and low-mid qualities of the Neumann U47 and the upper-mids and highs of the AKG C12.” Want more classic mic name-dropping? 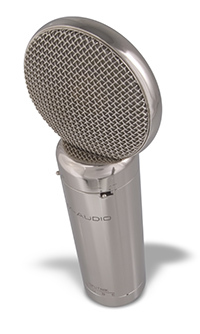 M-Audio compares the upside-down tube capsule to the Telefunken 251. Now, warning: if you happen to run into someone in sales from M-Audio, they might try to stun you in your tracks by reciting phrases like, “SputnikÃƒÂ¢Ã¢â€šÂ¬™s Class A amplifier circuit is an all-discrete transconductance design based on thermionic studies by researchers at Harvard and the American Institute of Physics.” But, mic rocket science aside, it’ll be interesting to see if this mic can live up to its claims. If it sounds anywhere near as good as they say it does, it could make a nice splurge for a home musician. With that in mind, the kit comes with a power supply, shockmount, and even a flight case. Mic gurus? Already got a favorite condenser in the US$700 range? Let us know in comments.